Grilling pork ribs on the George Foreman Grill is a two step process. Placing raw ribs on the grill generally results in tough meat, not the typical fall-off-the-bone texture that most people think of when enjoying ribs. Taking the time to do this will render juicy ribs with a crusty, charred exterior. These will remind you of the ribs that are cooked low and slow over a fire pit, but without having to babysit the fire or baste the ribs. It is best to use baby back ribs for a contact grill, as they are fairly thin. I accidentally bought spareribs the first time I did this. If you do use spareribs, follow the note I have added in the directions section. These meaty ribs are very tasty. Pork used to have a bad reputation for being too high in saturated fat and not safe to consume unless it was cooked to oblivion. Some large conventional pig farms are often overcrowded, not particularly clean, and the pigs are fed a grain and bean based diet. Pigs are omnivores and will eat most things, yet they do not thrive optimally on only processed grains and soybeans. It is worth the investment to find a butcher that carries pastured or free range pork. The tasty fat will still be there, but the flavor is so much more intense than hogs raised conventionally. If possible, look for heritage breeds or pork that has been labeled “humanely raised” from farms that allow for the animals to walk and run in the open. These pigs will likely have grazed on acorns, grasses, roots, bugs, and worms, not just soy and corn products. They have never been given growth hormones or antibiotics. If you have ever visited a farm like this, you will see playful, happy animals. If you have ever tasted the meat of these hogs, it is sweet and has hints of nuts, berries, grasses, etc. You may even notice the fat is a creamier, richer color. If pastured or free range pork is simply out of your budget, look for grocery store pork that is labeled hormone and antibiotic free. This recipe cooks the pork thoroughly, so there should not be a concern for the safety of the finished dish. This recipe should take approximately 45 minutes to prepare, 4 – 24 hours to marinate, and 8 minutes to grill. It will serve 2 hungry people. Double the recipe to serve 4 people. 1. Lay the ribs meat side down on a clean cutting board. Remove the membrane that covers the rib bones by piercing and slicing it at one end with a blunt knife. You should be able to grab the cut end with a paper towel and peel the layer of membrane off. Here is a video showing how it is done. 2. Place the ribs halves in a deep pot and cover with the broth and wine. Add the bay leaves. It is okay to layer the ribs one on top of the other. If more liquid is needed, add more broth or water. Bring the liquid to a boil. Turn the heat down to a slow rolling simmer and cover the pot with a tight fitting lid. Simmer for 30 to 40 minutes until cooked through and tender. The liquid will evaporate, so rotate and turn your ribs a couple of times so that they cook through evenly. 3. Remove the cooked ribs to a glass baking dish and discard all of the boiling liquid. 4. Make the BBQ glaze while the ribs are chilling in the baking dish. Add all of the glaze ingredients into the same pot you cooked the ribs in. Bring to a boil. Lower the heat and simmer for 8 to 10 minutes or just until thickened. 5. Pour the glaze over the ribs, turning to coat. Allow the ribs and glaze to cool. Cover and refrigerate for 4 to 24 hours. Turn once halfway through. 6. Remove the ribs from the refrigerator approximately 35 minutes before grilling so they come almost to room temperature. 7. Preheat the George Foreman Grill to high. Coat the grill plates with a light oil, such as canola. Using clean hands or a spoon, wipe most of the glaze off of the ribs into the baking dish. Grill for approximately 6 to 8 minutes with the top closed. You are looking for a nice char or bark on the outside of the ribs and a warm center. 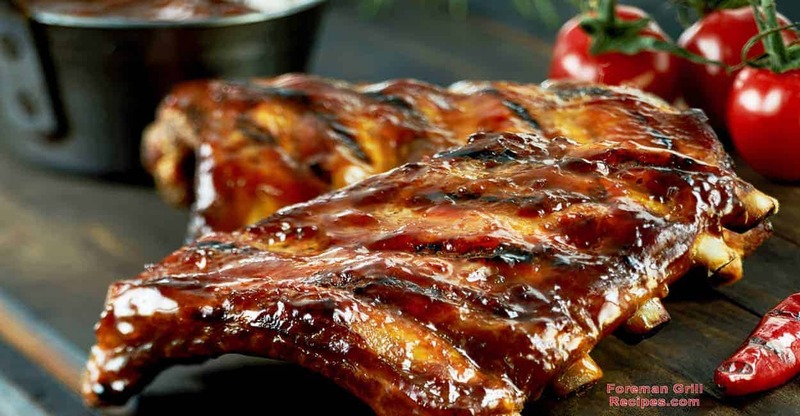 While the ribs are grilling, heat up any excess BBQ glaze in a small saucepan or microwave for serving with the ribs. Note: If using thicker spareribs, as I did the first time, you may need to simmer for up to 50 minutes. Spareribs seem to have a lot more meat than baby backs, at least at my butcher shop. You might also have to grill them a bit longer. My first attempt, with spareribs, I simply sliced the ribs into individual pieces after I marinated them and grilled the individual rib portions. That seemed to work nicely. These ribs are so good that I could just eat them alone. But, if you are serving them to friends and family you might want to consider a few comfort food side dishes. There are some dishes that come immediately to mind and one that I will share the recipe for. I love slow simmered greens, such as collards and Swiss chard, with the pot liquor that is supposedly full of nutrients. I can make a pretty mean mac & cheese baked in muffin tins. And, of course, a crunchy coleslaw with sweet, sticky ribs is a perfect match. But, my go-to favorite is beans with my pork. Since I am writing this in the late spring, I think a classic 3 bean salad is in order. While I am someone who cooks dried beans from scratch, for 3 bean salad I go right for the organic beans in cans. I simply rinse them well. All cans are 15 ounces in this recipe. This recipe will take approximately 10 to 15 minutes to prepare. Then, it will chill in the refrigerator overnight or for as long as the ribs are marinating. So, make this while the ribs are boiling or already in the fridge. This gets better with age, so resting in the fridge for 12 to 24 hours is a good thing. This salad will serve 4 people easily. 1. Open the cans and empty the beans into a colander. Rinse off the canning liquid. Allow to drain until almost dry. 2. In a large bowl, whisk together the vinegar, EVOO, sugar, mustard, salt, and pepper. 3. Mince and chop the onion, bell pepper, parsley, and basil. Add these to the vinaigrette and mix well. 4. Stir in the beans to coat well with the dressing. Cover and chill for at least 4 hours, or overnight. Serve with the ribs and allow the BBQ glaze to mix in a little.